The aerospace industry is no longer composed of local and individual businesses. Due to the complexity of the products (their size, the number of components, the variety of systems and regulation constraints), the design of an aircraft or a launcher involves a considerable number of engineers with various fields of expertise. Furthermore, aerospace companies often have industrial facilities all over the world. In such a complex setting, it is necessary to build virtual experiments that can be shared between different remote sites. Specific problems then arise, particularly in terms of the perception of other immersed users and of interaction tasks involving several immersed users. We are working with Airbus Group in order to design efficient collaborative interaction methods. These collaborative sessions allow multiple sites to be connected within the same virtual experiment and enable experts from different fields to be immersed simultaneously. 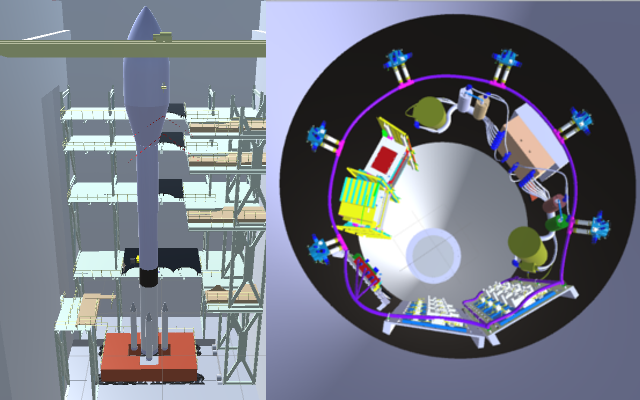 For instance, if a problem occurs during the final stages of a launcher assembly, it may be necessary to bring together experts on different sites who were involved in previous steps ( initial design, manufacturing processes). Design of basic communication tools for the aerospace context. Pano: a 360° visualization system that’s facilitate the communication in the case of guiding someone else. Design of an Annotation System for taking notes in VR.